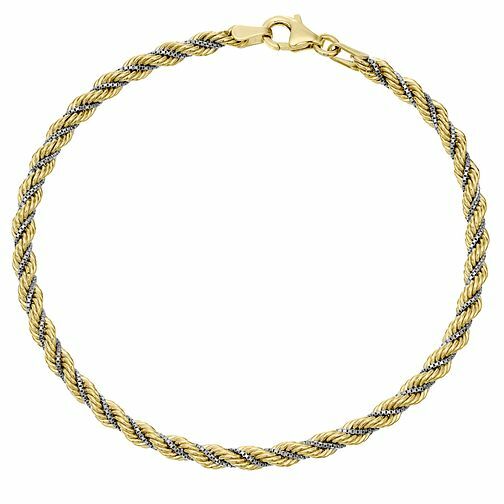 Elegantly crafted in 9ct gold with delicate 9ct white gold woven through for contrast, this beautiful rope bracelet is finished with a lobster clasp fastener. A classic accessory offering timeless sophistication for the modern woman. 9ct Gold 2 Colour Rope Bracelet is rated 1.0 out of 5 by 1. Rated 1 out of 5 by Anonymous from Really bad Boyfriend bought it for me for Christmas, wore it few times and white gold part fell apart. He bought additional insurance so didn't have a problem to exchange it for a new one. Second bracelet I wore for literally 2 hours and had the same problem. Couldn't get money back because of store "policy". I hardly never wear jewellery because I cant at work, really poor quality of this product, I am highly dissatisfied.